I didn't want to, but I went climbing. It had been a good, long while since I'd been to Rockspot, so I decided to tag along with j2 to climb with him and the rest of the Meetup group. I was feeling sore, and tired, and it definitely showed in my climbing. The best part of Wednesday night climbing at Rockspot is that when we're done, everyone heads to the Village Manor for food and drinks. And for a whole in the wall bar/restaurant, they have some GOOD food. Yea, so the best part of my night was my post-climbing food, what of it? Julia and I made plans to run followed by dinner at a nearby-ish Mexican restaurant. Seems like exercising + eating was the theme of the week. 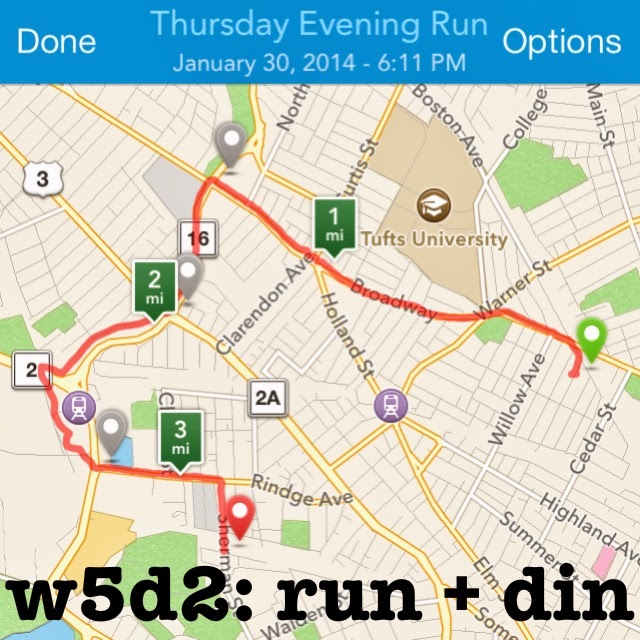 It was a mild night (well, as mild as it can be in the middle of winter in Boston) and we got in almost 3.5 miles at a 9:55min/mile pace before making it to the restaurant. It was the perfect Thursday night. I got to catch up with a friend, get in some miles, and to eat a delicious dinner. How can it get any better than that? Social media has allowed me to make a lot of new friends. It's also been a great way for me to reconnect with a few of my college friends/sorority sisters. I betcha never would have guessed that I was in a sorority, or maybe that's not such a surprise? Who knows. Anyway, Kate and I have been corresponding via Twitter and Instagram. We both live in Somerville, and we go to the same places, though never, it seems, at the same time. Finally, we made plans to climb together and made it into a group hang. We caught up, did some climbing, did some chatting, and good times were had by ball. Considering I started the challenge with a run, it would have been very fitting to end it with a climb. Too bad I decided to torture myself a little more and to extend the challenge until I leave for my Cancun vacation. 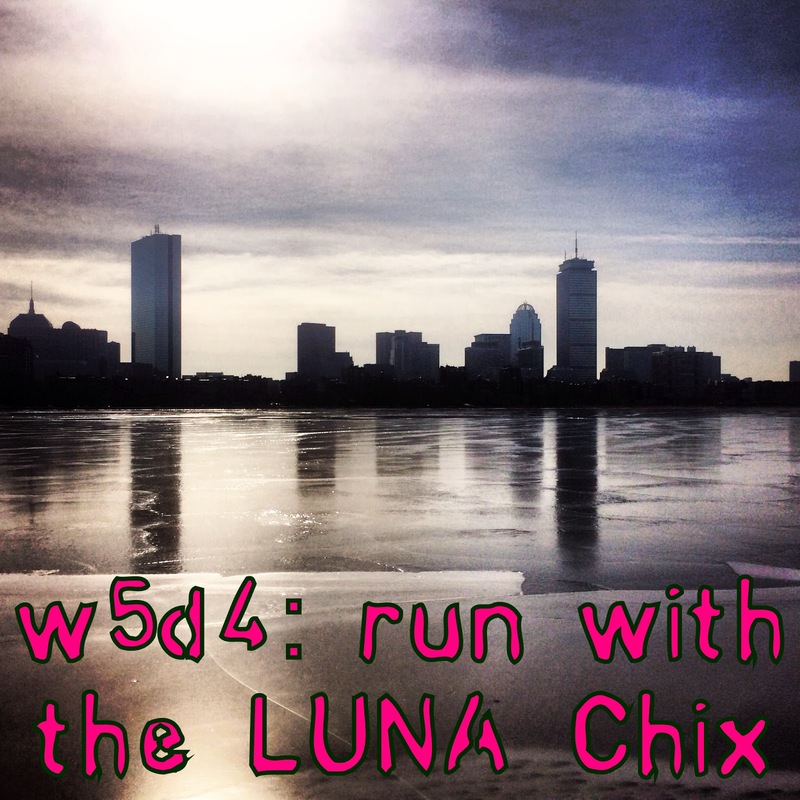 The LUNA Chix season usually goes from April to late October. This year, a few of my teammates had the great idea to hold monthly runs at Athleta to keep people going through the winter, and so far it's worked out wonderfully. We had about 15 women show up for the run and we did a 4.4 mile loop around the esplanade at a 9:30min/mile pace. It was relaxed, and it was fun - two things that are really important to me when it comes to off-season runs. I could not have asked for a better group, or for better weather. I can't even believe that I'm writing this - but I felt over dressed in crops, a tank, and a long sleeved tech shirt. By the middle of the run, I was so warm that I actually tied my long sleeved shirt around my waist. Yes, my friends, I was running through Boston. On February 1st. In a tank top. Though, don't worry. As I type this post, sleet is currently pounding the windows in the midst of the latest blizzard. So, looks like everything's back to normal. So, I registered for this race on January 2. I guess means that I technically failed at one of my rules, which was not to spend more than $10 on any activity. However, the challenge was also supposed to end on January 31, so let's just call it a draw, shall we? 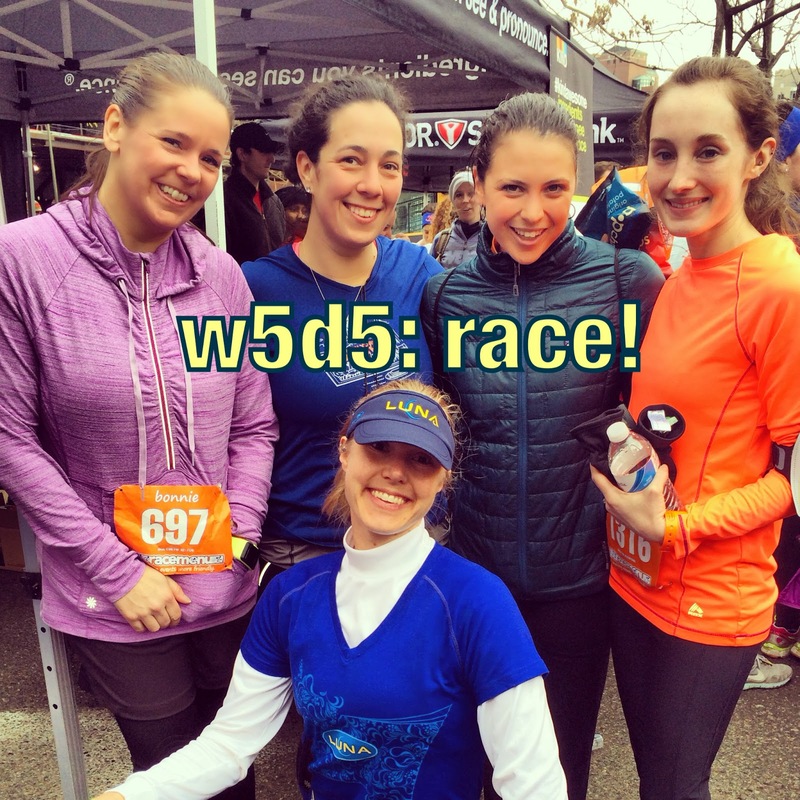 I have mixed feelings about the Super Sunday 5 miler. On the one hand, I like the course, and that it's relatively close to my house. The weather is always a crapshoot, but that's not a surprise at this time of year. Also, the proceeds go to a cancer charity, which is always a god thing. There are a few things I didn't like about the race this year. The post-race party was an absolute mess. I couldn't get anywhere near the food or the drinks, which is sort of the whole point, right? They also ran out of water for the finishers, though luckily Brittany had grabbed an extra when she crossed the finish line. My biggest issue, however, was the race director and how he worded some emails that were sent out prior to Sunday. Furthermore, I was floored at how he responded to me on Twitter when I voiced my dissatisfaction. I can't support an organization that doesn't respect the views of its patrons. 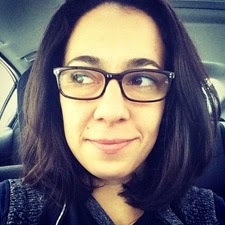 I don't mean to be cryptic, I just don't feel the need to go into detail about it on my blog right now. I don't begrudge anyone for participating, I have just decided that I will no longer participate in this race (or any others put on by the company). Despite any negativity, the weather was perfect. I should have learned my lesson from the day before because, again, I was overdressed. I also hydrated a biiit too much prior to the start and I had to pee just as the race was beginning. Luckily the race course runs by a Starbucks where we knew there'd be a bathroom, so Lisa and I ducked in to quickly use the facilities. We weren't the only ones who had that idea, as another runner came in just as we were leaving. We spent the rest of the race trying to catch up to Brittany (who proved too fast to catch) and Bonnie (who we found about half a mile from the finish). Last year, I ran this race in 51:30 (10:20 pace). Granted, I had a chest cold, but this year was significantly better. My gun time for this year's race was 48:50, and that includes the bathroom stop. I paused my watch when we stopped to use the bathroom (yea, a little cheat-y of me, but whatever), so my watch time was 46:23 with splits of 9:12, 9:18, 9:17, 9:19, 9:09 (9:14min/mile pace). Even with the bathroom stop, I technically had a PR. Hey, I'll take it. This class marked the end of my Livingsocial classes for Bolly-x. On the one hand I'm excited that I managed to use it up before the expiration date, and yet I'm sad because this class is so much fun. Though, there were parts of the hour-long class that were NOT so fun for me. I'm not sure why, but my stomach was hurting me somethin' fierce, and it made it tough to really get into the dance moves. Danielle still has two classes left on her voucher, and I'm definitely planning on going. It's only $12 for a drop-in, and they also let us know that if you can attend for free if you volunteer to check people in prior to the start of class. Not a bad trade at all, if you ask me! You know what's really great motivation to get outside for a run? A blizzard. Bolly-x class runs from 8:30-9:30, and I wasn't able to fall asleep until late on Monday, which meant that I was most certainly not going to drag myself out of bed early to run. Luckily for me, it was warm enough to run the 2 miles each way to my Tuesday appointment in Harvard Square. I was able to get in 4.15 miles at a decent pace. It felt like a really nice way to close out week five of the challenge. What a fun week! There have been times along the way throughout my month(+) of movement where I've been exhausted, cranky and sore. But mostly I'm getting used to doing something active daily. Last year, I found myself getting pretty stressed at the idea of having to fit it all in. I'm always pretty active, but the last five weeks have reminded me of how happy and calm I am when exercise is a big part of my life. Though, I have to say, I am very much looking forward to getting my rest day back!